When Ryan Strome was traded from the Edmonton Oilers to the New York Rangers in November, the move did not make much of an impact around the NHL. The trade, which saw the Rangers give up Ryan Spooner, appeared to be a wash. The only real impact it looked like it could have was to send a warning shot to the players on the rebuilding Blueshirts: if you don’t produce or fit with the team; no matter veteran or new face, there will be a consequence. But what a difference a few months makes. The move ultimately had no impact on the Rangers’ standing in the 2018-19 season; the team is currently 28-32-13 with 69 points and set to be officially eliminated from playoff contention. The rebuild continued with veteran talents Mats Zuccarello and Kevin Hayes being sent away in the hopes of drafting and finding young talent to develop and turn into potential champions. That was the point of this season: to get younger, to develop and see who fits the mold. And that’s what the Strome trade was all about. 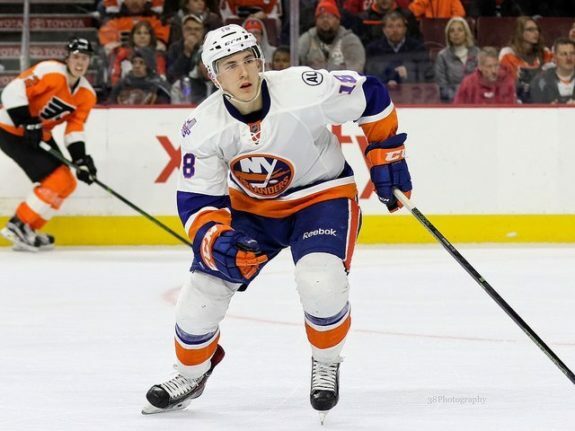 Some say that a change of scenery can help an athlete re-find themselves, and that appears to be the case here with Strome. He struggled to find his footing and fit while a member of the New York Islanders and the Oilers, but things seemed to have changed for the better with the Rangers. It’s crazy to think he can turn around and suddenly live up to all of his potential from when he was drafted by fifth overall by the Islanders in 2011. But with his play, current contract and how he’s produced, there’s no reason to think trading for him was an underrated move by the Rangers. When Strome first came into the NHL, there was hope he could produce a lot of points for whomever he played for. He was a terrific scorer in Canada while playing for the Greater Toronto Hockey League’s Toronto Marlboros, the Ontario Hockey League’s Barrie Colts and Niagara IceDogs and the country’s World Juniors team in 2012 and 2013. His success followed him into the AHL in 2013-14, his first full season with the Islanders organization, when he totaled 33 points in 23 games — leading the AHL at the time — before getting called up to join the Isles. He went on to score 18 points in 37 games before playing in all but one of the Islanders’ games the next season and hitting the 50-point mark by scoring 17 goals with 33 assists. But the next season, things took a nosedive. Strome could muster no more than 30 points in his next two NHL seasons, playing 69 and 71 games, respectively, and the Islanders sent him to Edmonton prior to the 2017-18 season. His scoring did not improve, and after struggling to find a fit in Edmonton, and just a goal and an assist in the first 18 games of this season, Strome found himself on the rebuilding, youth-oriented Blueshirts. Coincidentally, Spooner also had just a goal and assist when the Rangers sent him to the Oilers in the exchange. While Spooner has continued on his rough road in a season where he’s now been put on waivers, demoted to the AHL and traded to the Vancouver Canucks, Strome has found a second wind in his new home. 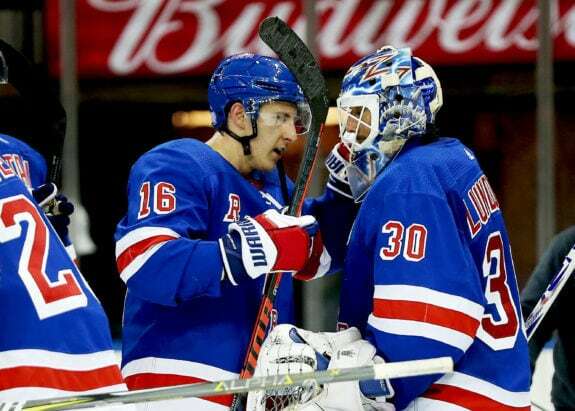 He is currently fifth on the Rangers in goals with 13 and eighth in points with 25. His shooting percentage has gone up from the measly three percent he had early this season in Edmonton to 20 percent. 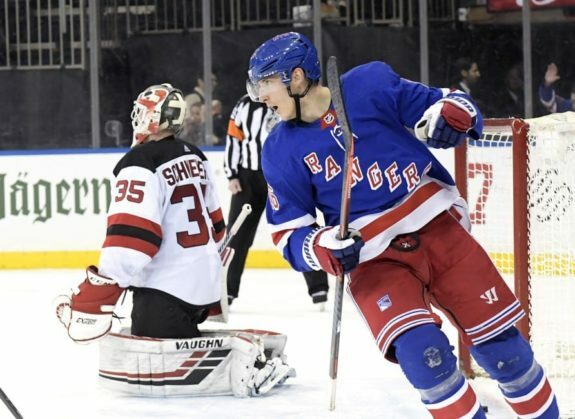 Strome on Rangers for Present & Future? More importantly, Strome has won over head coach David Quinn with all-around ability, and that and his experience has given him more ice time, second-line placement and more responsibility since the trade deadline. Add that to his seasons of professional experience at just 25, and he fits in with the team as both a young blood and a player to look up to in the locker room. Strome has shown he can play wherever Quinn needs him to, as while he’s a natural center — and played 32 straight games at the position since January — he recently moved over to the wing and played on the first line. While this could go hand-and-hand with his increase in responsibility since New York traded Hayes, it also allows for some of the Rangers’ younger centers to get more playing time. But what comes next for Strome after this season? He’s still under contract with New York next season at $3.1 million, and that’s not bad for a player who is considered to be bottom-six talent. The Rangers could always send him off in another trade for the rebuild, but would other teams be put off by his previous struggles and failure to live up to his 2011 draft potential? In these circumstances, a trade might force the Rangers to receive just a low-level draft pick in return. But with his cheap price tag and surprise output since joining the team, it might not be crazy for the team to keep Strome around. If he ends the season with the same kind of praises as he’s got now, why shouldn’t the Rangers take the shot? He still has a little more time to develop, and he’s already been in Quinn’s favor, appearing to have gelled with teammates on and off the ice. Strome may not make it back to the playing level of his 2011 draft stock or his 50-point season with the Islanders, but this isn’t about calling him the best or a need. In a season focused on rebuilding and growing pains, it’s always nice to see a pleasant surprise and something that works out in the team’s favor. And Strome has been that this season.